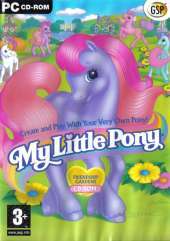 This is a game for young children that is based on the 'My Little Pony' franchise. The game starts with the player creating their own pony using a paint box screen to change the colours to their liking. Then the pony is given a name and the player is taken to Ponyland where the game begins. The game starts at a bridge. To the left is the farm where the player gets to know and train their pony. To the right is the pony village. The player starts on the farm where they feed, groom and train their pony. There is a limited supply of food in the inventory to start with and more can be grown or picked from trees. When the pony has grown she will be confident enough to enter the village and have fun with other ponies. In the village there are four cottages, each with its own resident and mini-game(s). Ivy's Beauty Salon where the player can dress and/or style their pony's hair. Light Heart's Game Cottage naturally has the most activities. There's Tic-Tac-Hoof, a Tile Switch Puzzle, videos to watch, books to read, Sweet Berry's kitchen where cakes can be baked, and pictures to colour in. Sun Sparkle's Dance Studio has a dance floor with coloured squares. The mini-game here is a 'Simon Says' like game where the player has to repeat the sequence in which the dance floor squares light up. Morning Glory's schoolhouse has a memory game and pictures to print. Throughout the game the player can take pictures of their pony, these are held on an album along with the pony's pet certificate, awards, the pony diary and mail messages.